Sharon Olson is a retired librarian, a Stanford graduate, with an M.L.S. from U.C. Berkeley and an M.A. in Comparative Literature from the University of Oregon. Her chapbook Clouds Brushed in Later (1987) won the Abby Niebauer Memorial Chapbook Award. A previous full-length book of poems, The Long Night of Flying, was published by Sixteen Rivers Press in 2006. She has published (with co-author Chris Schopfer) numerous articles about the Sandford family of New Jersey in The Genealogical Magazine of New Jersey. After retiring from the Palo Alto City Library she and her husband moved initially to Guilford, Connecticut, and presently live in Lawrenceville, New Jersey. She is a member of Cool Women, a poetry performance ensemble based in Princeton, New Jersey. See author’s blog at slopoet.blogspot.com. 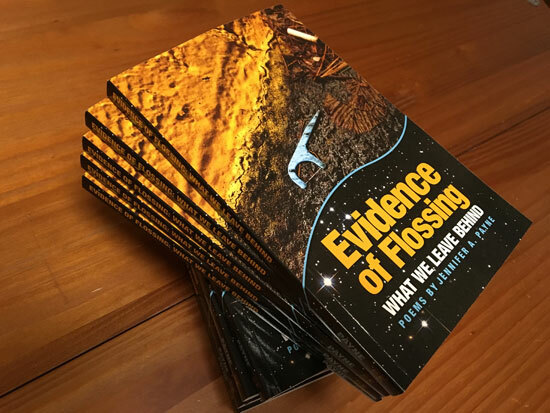 Evidence of Flossing: What We Leave Behind, the new book by Guilford Poets Guild member Jen Payne, will make an appearance at Rock Garden in Branford on Saturday, November 18 from 11am – 2pm. See the Evidence, meet the author, and support local business during this November book signing event. Evidence of Flossing: What We Leave Behind follows on the heels of Payne’s 2014 well-received book LOOK UP! Musings on the Nature of Mindfulness, and continues a dialogue about our innate connection with nature. It features 73 poems and more than 80 original and vintage photographs, including a series of discarded dental flossers that inspired the title of the book. The event is free and open to the public. Refreshments will be served. Rock Garden is located at 17 South Main Street, Branford, CT. For more information and to purchase copies of the book, please visit www.3chairspublishing.com.